Most visitors to Israel come to see Jerusalem. But a Tel Aviv visit is a must-experience. This booming city, set along a Mediterranean beach, is Israel's hub of culture, commerce, and communications. Tel Aviv is an exciting city where you feel the excitement in the air. Tel Aviv is set in the mid-point of Israel. Its only border is the Mediterranean sea. Visitors are as safe here as in any city today. If you've been disappointed by the rockiness of Mediterranean beaches, you won't be disappointed by Tel Aviv's beach. 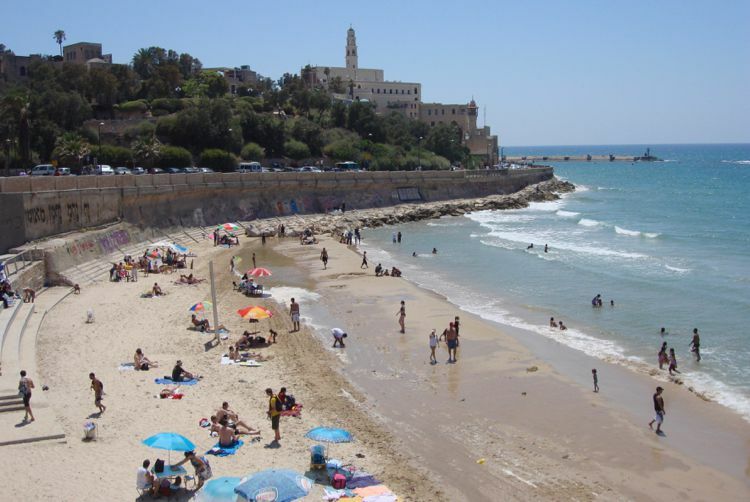 It is a white-sand beach that hems the length of Tel Aviv and Jaffa, for nearly nine miles . No rocks, no foot pain, no flipflop loss. What Central Park is to New York and the Venice boardwalk is to Los Angeles, the beach is to Tel Aviv. This is where you go to relax, to exercise, to socialize, And of course to do beach things: swim, sun, splash with your kids or your dog. Tel Aviv's long beach promenade is a giant outdoor playground and gym. This is wher eocals come for all sorts of outdoor activities: Walking, running, biking, blading, skateboarding, beach volleyball, handball, and more. Lace up your sneakers and come on out. People have wanted to live along the bay of Jaffa since prehistoric times. This beautiful port, once the home of the Hebrew tribe of Dan, has been a trophy for conquerors such as the Phoenicians, Egyptians, Romans, Assyrians, and Ottomans. Today, Jaffa is the home of Israeli Jews, Muslims, and Christians. Archeologists like to spend time in Jaffa, too, discovering ancient docks, forts, and temples. But Florentin Is Real, and Far from "Gentrified"
But if you didn't know this, you'd think that Florentin was simply a great urban neighborhood -- and an unpretentious one. It is still scruffy, dusty, and authentic, with more old shops and businesses than new ones. But even Florentin's new cafés, boutiques, nightclubs, and performance spaces have an appealing hominess about them. Florentin has tons of character, and local characters, too. There's no glitz whatsoever in Florentin -- except for the theatrically dressed local characters, most of whom are Israeli designers and performers. Visiting Tel Aviv? Consider taking Guy Sharett's Florentin Graffiti Tour; and read more about Florentin. Israel is a pilgrimage place of three religious faiths. And the Levinsky Market in Tel Aviv is a pilgrimage place for foodies. Levinsky Market is much more than an outdoor market. It's a whole urban district devoted to food: buying and selling food and spices in wholesale stores and retail shops and stands, and eating food in scores of places to eat. Levinsky Market's dining venues cover restaurants, cafés, open-air stands, and food trucks. What Kind of Food Can You Taste in Levinsky Market? Some visitors wander around, noshing. But there's a great way to get the big picture and varied tastes of Levinsky Market. You can take a semi-private tour led by insiders; the most popular are with Delicious Israel. Or you can purchase a book of tasting tickets for six different Levinsky vendors, including a DIY hummous bar (Garger HaZahav), Ashkenazic chopped liver (at Sender) and burekas (at Panso's). If you're the type of traveler who loves to wander around with a shopping bag, taking in the scene and looking for interesting souvenirs. Tel Aviv is the place for you. It's filled with outdoor markets of all kinds: flea markets, food markets, you-never-know markets. Certain creative cities around the world have become global hubs of food culture. This gourmet crown has been worn in recent years by Barcelona, Copenhagen, and Portand, Oregon. One very happening food city right now is Tel Aviv. Here, a new generation of homegrown chefs is busy masterminding a new wave of Mediterranean cuisine. Today's young Israeli chefs reinvent Mediterranean cuisine. They start with this classic cuisine's fresh seafood and olive oil. Then they add elements from the Holy Land's bounty and from Jewish culture. So you will see and taste Israeli ingredients like sesame, honey, and dates. Your palate will be deliciously aware of exotic spices from the homelands of Israel's "Mizrahi" Jews: Morocco, Tunisia, Egypt, Yemen, Iran, and even Ethiopia. You can also find Eastern European tastes from the Ashkenazic lands; Porter & Sons, a TripAdvisor superstar, is a pub that restaurant serves house-made sausages and beer. Suppose you don't feel like Israeli food. In this international city -- full of expats with global tastes -- you can find whatever you crave. Every imaginable cuisine is represented, often by expat chefs native to that country. Tel Aviv gourmets are gaga over Sarona Market, which opened in 2015. This indoor-outdoor marketplace features almost 100 food shops and dining spots. in a newly fashionable downtown area. Food shops cover it all: bread and pastries, seafood, meat, produce, cheese, spices, oils, wine, beer, coffee, chocolate, deli-style prepared food. Some shops are international, like Fauchon from Paris and Max Brenner Chocolate. Restaurants focus on pizza, sandwiches and wraps, soups, salads, burgers, falafels, bourekas, Chinese and Indian food, sushi, and more. The restaurants range from bistro-like to counter seating. Shown above: Freestyle Ramen by Aharoni, run by busy celebrity chef Israel Aharoni. Check the Sarona Market website. Tel Aviv may be geographically set in the Middle East. But its attitude toward personal choices is amongst the world's freest and friendliest. Here, LGBT lifestyles choices and are more than tolerated. They are embraced and celebrated. The city rocks year-round with gay festivals and events. The biggest is Gay Pride Weekend, June 4 to 10 in 2016. In 2017, over 35,000 travelers arrived from around the world to participate. See a thrilling video on this page. Every city has a grand hotel: the most famous hotel in town, the place with the stories and a see-and-be-seen lobby. The Dan Tel Aviv Hotel is the very definition of a grand hotel. It opened in 1953 in an exceptional location and soon became an enduring tradition for upscale Tel Aviv visitors. Rooms vary tremendously. All are comfortable, subtly decorated in contemporary style, with very comfortable beds and plenty of closet and shelf space. The best rooms and suites have beach views and a patio or balcony. Guests in sea-view rooms and suites have access to the King David Crown Lounge, an excellent VIP lounge with all the lounge perks you expect. This hotel is justly renowned for its buffet breakfast. Israel teems with cultural institutions and happenings. The country's preeminence in the arts was kickstarted by the exodus of Jewish artists of all kinds who were able to escape the Holocaust. Today, Israel is a hothouse for young artists. Many of them are based in Tel Aviv. U nlike other global hubs like New York and London, is still affordable for creative people, so they make their art right here. Tel Aviv is a cit of educated folks with a cultural background that honors the arts. Here you will find: The Tel Aviv Performing Arts Center, featuring concerts, plays, ballets, and more at The Israeli Opera, the Cameri Theatre, and at outdoor performance spaces; dance of all kinds has a studio and performance home in Suzanne Dellal Art Centre (see a schedule); showcases for great Israeli jazz musicians: both established globetrotter and young "cats"; here's a roundup of Tel Aviv jazz venues. The Tel Aviv Museum of Art houses 20th-century art. The art is engrossing and excitingly modern, with masterpieces by Van Gogh, Kandinsky, and Jackson Pollock. See highlights of the collection. But the building's cutting-edge new wing, opened in 2011, announces Tel Aviv's modernity to the world. The museum's Amir Building, shown above, was designed by American architect Preston Scott Cohen, dean of the Harvard Graduate School of Design. Some Israelis and visitors adore it, others find it cold. It's shown above. Do you like it? Tel Aviv has emerged as a fashion hothouse with a unique style scene. But don't expect a place where everyone has the same look. People here are not interested in looking like everyone else. The best people-watching is in Tel Aviv's neighborhoods. not on its shopping streets. The style that characterizes Tal Aviv is simply individuality. The best shopping in Tel Aviv involves a hunt for unique Israeli fashion labels and designs. You'll find them at boutiques in the Neve Tzedek neighborhood and at Gindi Fashion Mall. Sneak preview: lookbook of Maskit, Israel's best-known label. Gindi Fashion Week, foundedvin 2011, spotlights Israel's top designers and emerging talent. The shows re held in October, and you can buy tickets. Gindi TLV Fashion week website (with video clips of the runway shows). Israel is the birthplace of many of the most ingenious websites and apps. One of them is Waze, the genius talking GPS navigator. Another is EatWith. Now a global phenomenon in over 150 cities, EatWith was launched right here in Tel Aviv. EatWish connects home cooks with adventurous visits. Using EatWith, you find and book private dinners at locals' apartments and homes. Most of the dinners are convivial gatherings of (typically) eight to 14 diners. You can book weeks in advance; some dinners are available for same-day booking. You pay on the app, and it cost less than a restaurant meal. Wine may be included, or it's BYOB. Many EatWith dinners are conducted in English (and most Israelis are English-speaking). What Kind of Tel Aviv Home Meals Will You Find on EatWith? This town is home to cooks of every cuisine. Whatever you're in the mood for, you'll find it: Israeli cooking, but also Italian, French, Spanish, Greek, Russian, Lebanese, Moroccan, Indian, Chinese, Japanese, Thai, Mexican, and more (including American). If You're visiting Tel Aviv, Jerusalem is no doubt on your itinerary. And no doubt on the way, you're going to stop at the Dead Sea to slosh in its healing mud, which will make you look nd feel t least five years younger). But there's another destination you should visit. Rent a car for a day (Budget has a location next to the Dan Hotel). And ask your invented-in-Te-Aviv Waze app how to get to Zichron Yaakov. (Ir's pronounced Zee-crone Yah-ah-cove). This hilltop village has a fascinating pedigree. Its founding in was assisted by Baron Edmond de Rothschild, a French Jewish philanthropist. Originally a farming community, it is today an arts village. And its surrounding fields now grow grapes. On one of the main roads leading to Zichron Ya'acov you will find Tishbi Winery. Bring you appetite and stop here. Tishbi Winery was founded in the 1880s by a Lithuanian family invited by Baron Rothschild to start a winery here. Their great-grandson, Golan Tishbi, is the winemaker and an overall visionary. Here's what you can do at Tishbi Winery. Luxury travelers can stay right in Zichron Ya'akov at one of the world's artiest boutique hotels. Elma Arts Complex Luxury Hotel is set within a music and art venue. The bad news: there are legions of homeless in Tel Aviv. The not-so-bad news: they are cats. They keep comfy in Tel Aviv's Mediterranean warmth and sunshine. And they are loved and cared for by Tel Aviv residents, who feed them their table scraps and proper cat food. Animal activists can take the credit for Tel Aviv's recently undertaken spay-and-neuter program. Feed the ferals! Think of the wild cats next time you don't finish meat, chicken, or fish dish you don't finish, cut it into small pieces, have it doggy-bagged, and feed it to the cats. Tel Aviv locals leave it in small piles so the cats don't fight over it. Find out more about Israel's feral cats.